Packed with the colorful flavors of the Centennial State, Centennial Celebrations commemorates the Junior League of Denver’s 100th Anniversary. The sixth cookbook in JLD’s award-winning collection, Centennial Celebrations includes more than 200 thoughtfully selected and thoroughly tested recipes for every season and occasion – from crowd-pleasing game day appetizers and traditional holiday favorites to light summer fare and winter comfort foods. Located at the base of the Rocky Mountains where urban sophistication meets outdoor adventure, Denver has become well known for its food, breweries, live music, and flourishing arts scene. 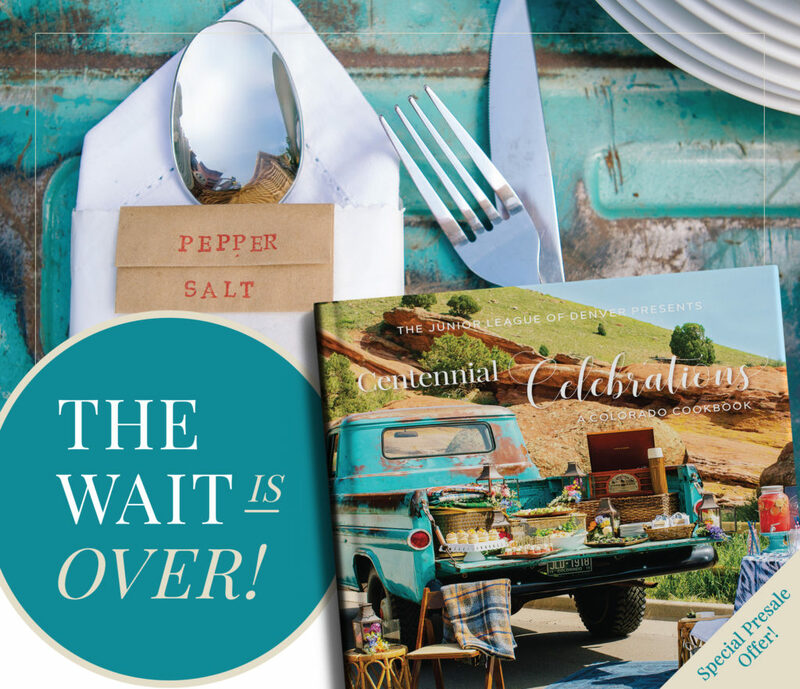 Centennial Celebrations is a journey of the senses featuring beautiful photography of fabulous gatherings at iconic Denver locations. The creative menus, recipes, and entertaining tips will inspire you to cook, connect, and celebrate… Colorado style! Take advantage of limited-time presale discount prices and order your case today! Purchase a case of 10 books for the special presale price of only $180. That’s 10% off the regular member price of $20 per book! Click here to order your case today or download a mail-in order form. Please direct general questions to Mary Beth McErlane, Centennial Celebrations Chair, at newcookbook@jld.org. To establish a wholesale account or to submit an order for an existing account, please contact Karen Mayo at wholesale@jld.org. Thank you to our wonderful cookbook sponsors!